Exposing new trends in collecting while exploring the reignition of interest in tapestry, Barrymore Laurence Scherer interviewed Simona Blau for the November 2007 issue of Art+Auction Magazine. “Clients are mixing styles, which opens the world of tapestry to a whole new group of art collectors,” says Mrs. Blau, referencing the broad tastes and eclecticism of her clientele. 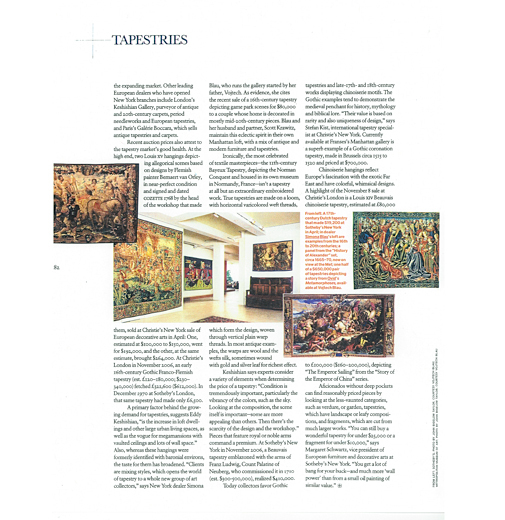 The article also spotlights Vojtech Blau Inc.’s Chelsea showroom with its mix of antique and modern furniture and tapestries. For More information, please visit Art+Auction Magazine online.